The Conam yard is probably one of the most vital "sources" of novelties in the Italian production and design in fact each Conam boat is innovative. Chorus 54 includes, thanks to her size and spaces, real innovations and "inventions" intended to become milestones for the future of yachting design. The concept of eliminating the side decks and of connecting the cockpit to the forward area by means of the flying bridge, thus extending the size of the salon is dear to Giuseppe Cimino. In addition, the beam if compared to boats of equal length is considerably smaller, thus improving the boat's balance and smooth performance at sea. Her outside line is extremely low and swift and the line of the hull combine in a logical and sophisticated order with the windows and the air vents, highlighting the revolutionary aesthetics of the boat. New solutions are especially applied to the arrangement belowdecks: the ample salon includes spaces and fittings that are, with no doubt, unthinkable on a 56 footer. Forward, there are three cabins with three private bathrooms and two of them (the master stateroom's and the VIP double staterooms's ones) include the shower fitted with nice wooden doors without any waste of free space. 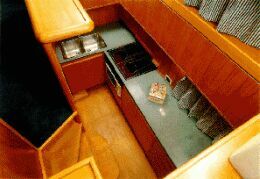 The galley is very ample, with ceramic hobs, a granite worktop and a 74-gallon fridge/freezer. 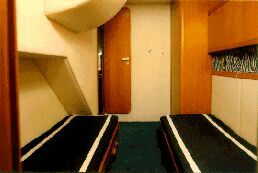 The crew cabin has a very good access and is very well arranged: there is one berth, a locker, a sink and the toilet is separated from the cabin. 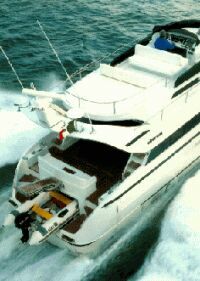 The Chorum 54 offers arrangements that are normally found on bigger boats: transom garage for the tender, gangway and two swimming ladders, aft mooring winches, ample forward sunning areas, dinette with double opposite settees on flying bridge, modern-design roll bar that covers part of the cockpit, double ladder to aft platform, bow thruster, etc. In addition, considering her excellent performing capabilities with a relatively small engine and low consumption (1200 hp), the wide variety of standard fittings and the alluring overall quality/price ratio suggest that the boat is innovative as well as the first boat of a successful series. Price with standard equipment and test boat power: Lit. 1,250,000,000 ex VAT. 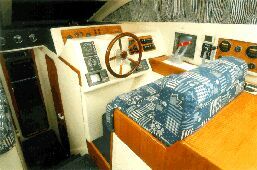 Characteristics of aft platform: teak deck, multi-functional hydroelectric gangway, two recessed swimming ladders, - transom garage with cradle for a 10'2"-tender, with 50-60% of tender inside the garage; freshwater shower, 2 side ladders with relative access to the cockpit; 220-V dockside electric connection. Description and characteristics of the flying bridge: self-supporting roll bar with radar and various antennae, 4 cockpit lights, 8'2"x6'3" sunning area, 2 5'11"-long opposite settees and table, pilot's and co-pilot's seat for three persons, dashboard with steering wheel and all controls of the lower helm station except for the radar, mini-bar with refrigerator. Galley: granite worktop, two sinks, four ceramic hobs, 60.8-gallon refrigerator, 13.2-gallon freezer, microwave oven, shelving, washer/drier on request. Standard fittings: bow-thruster, air conditioning plant, 7.5 kW generator, 24V and 12V battery charger, hi-fi stereo in the salon and in the master stateroom, 13.2-gallon water heater, 10'2" tender and 10hp outboard engine. Docking maneuverability: very good. 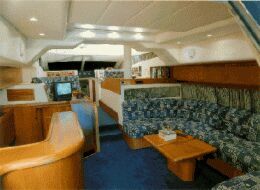 The boat's side decks and main deck area allow easy movement onboard during docking. Electrical panel and plants: very well fitted and of adequate size with excellent components. 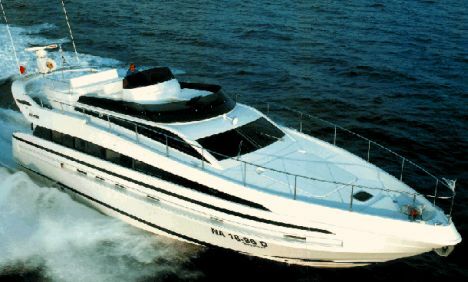 it is difficult to get accustomed to a motor yacht that is so different and new, yet so elegant and practical. The limitation of the Chorum 54 lies in her "fullness" and a detailed visit and test are needed in order to appreciate her different arrangement.